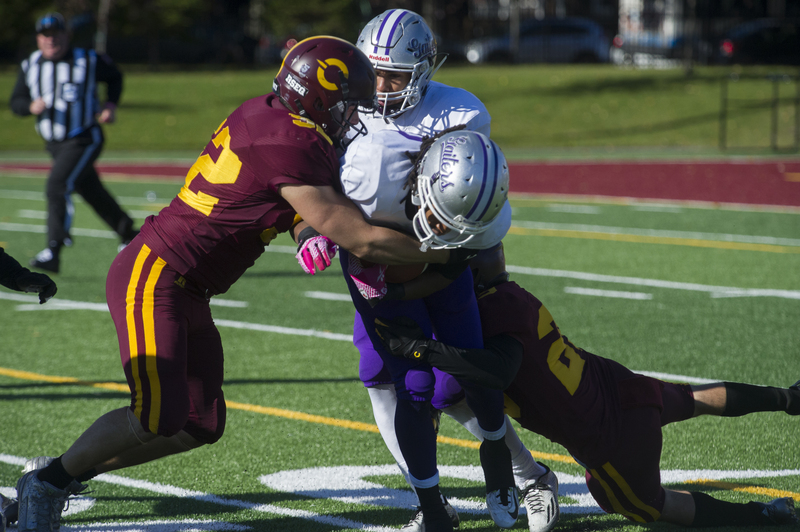 Concordia puts up 63 points in win against Bishop’s Gaiters Saturday at Loyola. The Concordia Stingers football team blew out the Bishop’s Gaiters 63-0 Saturday afternoon at Loyola. Quarterback Trenton Miller had an impressive stat line which featured five touchdowns, 388 yards passing and 90 yards through the ground. Concordia defenders tackling the Bishop’s ball carrier in Saturday afternoons game. Photo by Andrej Ivanov. The Stingers opened the game with a 68-yard drive down the field that ended in a 24-yard touchdown run from running back, Jean-Guy Rimpel. Later in the quarter, Miller would lead his side down the field and connect with wide receiver, Yanic Lessard for a 15-yard touchdown that gave the Stingers a 14-0 lead. The Stingers continued to put up points in the first quarter. Cornerback Connor O’Brien returned an interception 44 yards for a touchdown score. By the end of the first quarter, the Stingers were up 21-0. In the second quarter, Miller continued to make plays down the field, making his running ability known to the Gaiters defense. While Miller’s rushing game was impressive, Stingers coach Mickey Donovan attributed Miller’s running plays to his ability to read the opposing defense. Stingers receiver James Tyrell taking to the open field in Saturday game vs Bishops. Photo by Andrej Ivanov. Miller ended the second half with his second touchdown pass to Lessard after an incredible 69-yard bomb to receiver Justin Julien to make the game 35-0 for Concordia. The half would then end on a Gaiters safety which gave the Stingers a 37 point lead at half-time. Despite being up by 37 points to the 1-4 Gaiters, the Stingers didn’t ease up on their frail opponents. The team opened the second half with Miller’s fourth touchdown pass of the game. This time his target would be slot back Jahlani Gilbert-Knorren. Later in the quarter, Miller would throw an interception but redeem himself in the fourth quarter with Lessard’s third receiving touchdown. Another huge performance came from receiver James Tyrell who had 215 return yards and a 55-yard punt return touchdown in the fourth quarter. For Tyrell, the key to his success in the game had much to do with the blocking provided by the special teams unit. The Stingers defense also came up big, holding the Gaiters offense to a total of 149 yards. The win improved the team’s record to 3-3 which moves them closer to a position for a playoff spot. For Donovan, Saturday’s game was crucial step forward. The team will get the chance to improve their record to 4-3, and secure one of the four playoff spots in the RSEQ division.